I actually can’t remember the first time I had this dish, but suffice to say that it was love at first bite. While I’m an equal-opportunity-Korean-food-eater, I have to first say that this might be our CTO Alex’s favorite dish of all time. So Alex, this one’s for you! I’ve been a fan of Korean food for years, but only started bringing it into my own kitchen in grad school, when late-night YouTube watching brought me to the internet sensation known as Maangchi. Warning: once you start watching her videos, you may not be able to stop. Maangchi pretty much single-handedly brought Korean food to the masses, not only in the U.S., but around the world. She has fans everywhere and travels around the world to meet and cook with them. How cool is that? 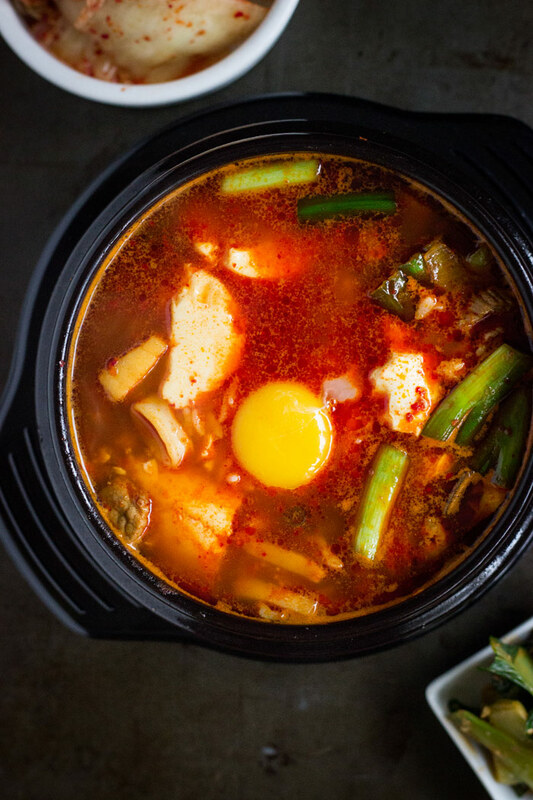 Through her, I started to learn about the different ingredients and techniques that make Korean food special (and, actually, not that hard), so I wanted to bring some of that to you today with this recipe for Soondubu Jjigae – a traditional, bubbling, spicy bowl of soft tofu stew laced with tender seafood and bits of pork. 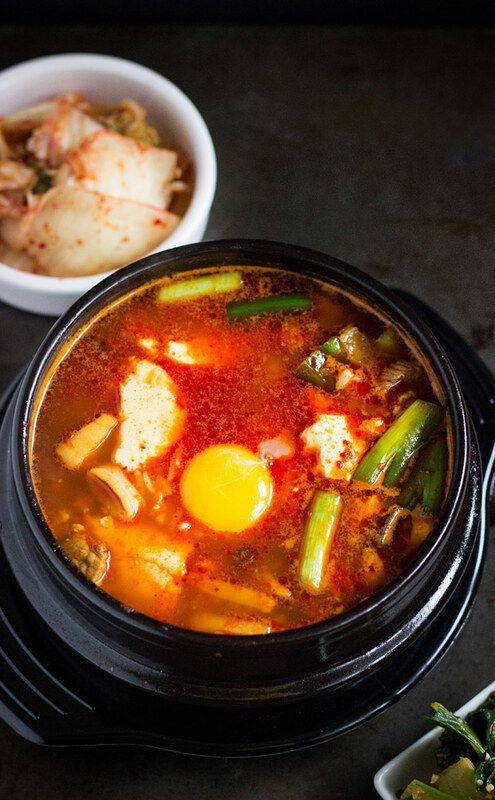 Soondubu jjigae is Korean comfort food at it’s best (and also, I must add, a killer hangover cure). It’s an all-in-one meal with a rich, flavorful broth and tons of seafood and tofu inside. While it might look ridiculously spicy, my version is quite manageable. You can always amp it up with an extra tablespoon or two of hot pepper powder, but just like this, it’s pretty much perfect. Consider this the first of your “primers” into cooking Korean food, particularly because it incorporates some of the key ingredients used in many Korean dishes (more on that below), and because it’s quite forgiving! Bubble everything together in a pot, and that’s about it! Before we get into the recipe though, I thought it would be helpful to run through some of the key ingredients of the dish in case this is your first foray into cooking Korean food at home. I don’t know about you, but when cooking new ethnic cuisines, pictures of ingredients are worth a thousand words! You can just show any of these pictures to someone at a Korean / Asian grocery store and they should be able to point you in the right direction. The backbone of Soondubu Jjigae and most Korean soups is the stock. 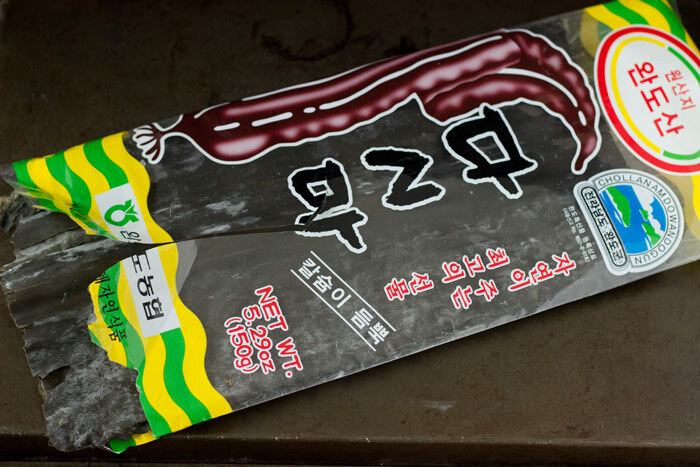 The two main ingredients in the stock are dried kelp and dried anchovies. Dried kelp comes in long, flat, slightly wavy sheets. It’s sold in a pack like this. Although there’s no English on the front of the package, if you look on the back, it says “dried kelp.” Works for me! 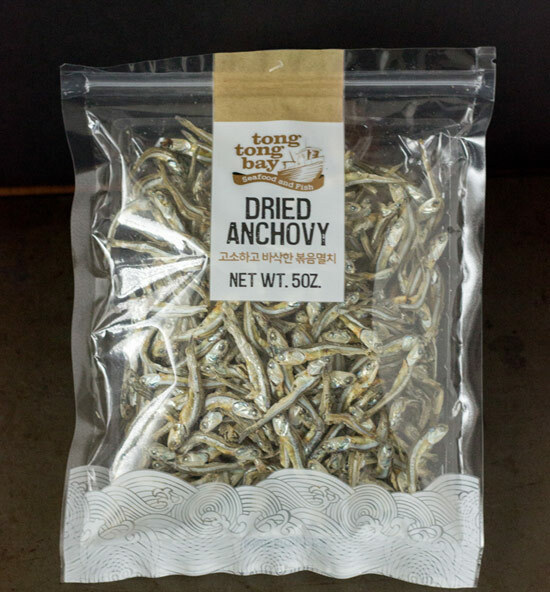 The second key ingredient for the stock is dried anchovy. These little fishies can be found in the refrigerated section of the Korean market and are sold in sealed bags like this. The anchovies should be just shorter than pinky-length. Though the entire fish is technically edible, some of it isn’t the most savory. That’s why the first step is to tear off the head and pull out the guts (the little tubular black part inside the belly). It sounds gross but since the fish are dried, it’s really easy! Now, moving on to the “spices.” There are two key flavorings that bring spice to most Korean dishes – gochugaru (Korean red pepper powder) – and gochujang (Korean red pepper paste). First up, let’s take a look at the red pepper powder. It’s sold in bags and is a fiery red color. 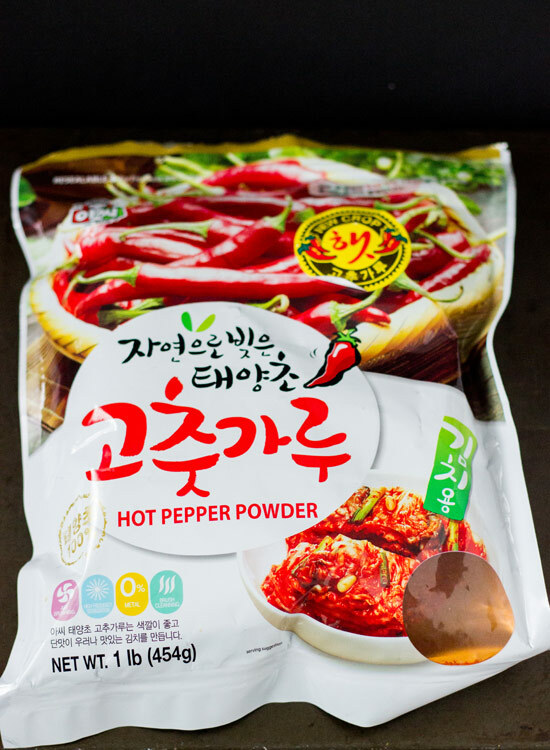 Unlike red chili flakes or cayenne pepper, Korean red pepper powder isn’t AS hot but still packs a punch. Korean red pepper paste – or gochujang – is sold unrefrigerated in tubs like the one below. It has a dark red color and is actually on the sweet-spicy side rather than being fiery hot. It lends a deep, rich flavor to dishes. 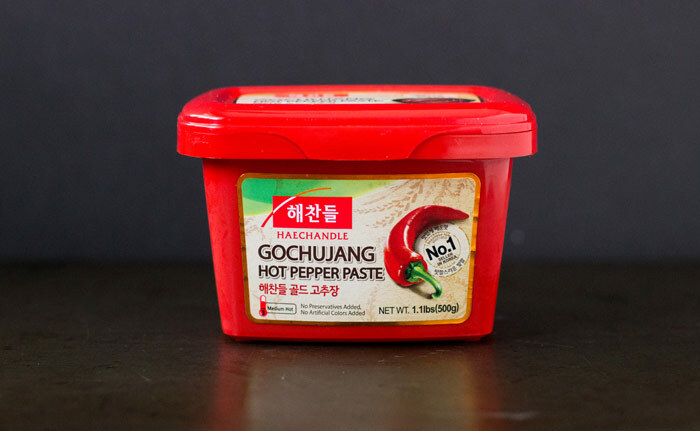 Gochujang comes in a variety of heat levels, and if you look in the bottom left of the label, you’ll notice that I opt for the medium-hot level. That’s usually good enough for me. 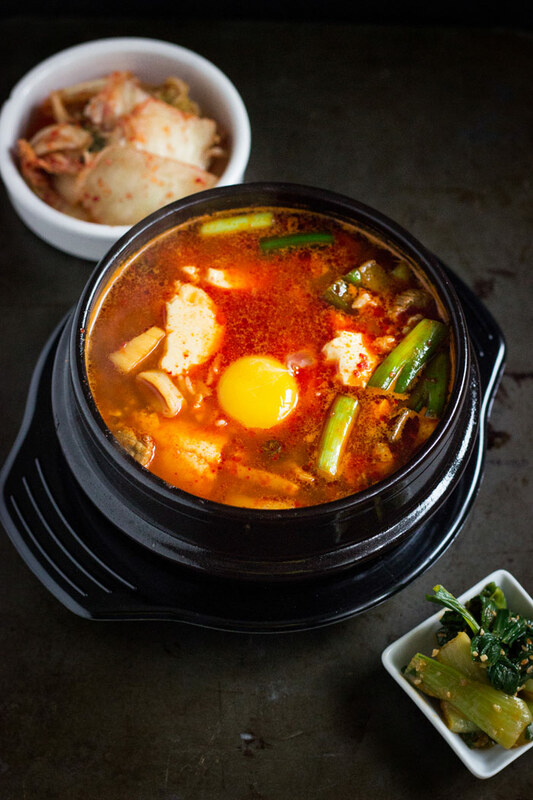 Last but certainly not least for this dish is the soondubu in Soondubu Jjigae, which is Korean extra soft (also known as silken) tofu. 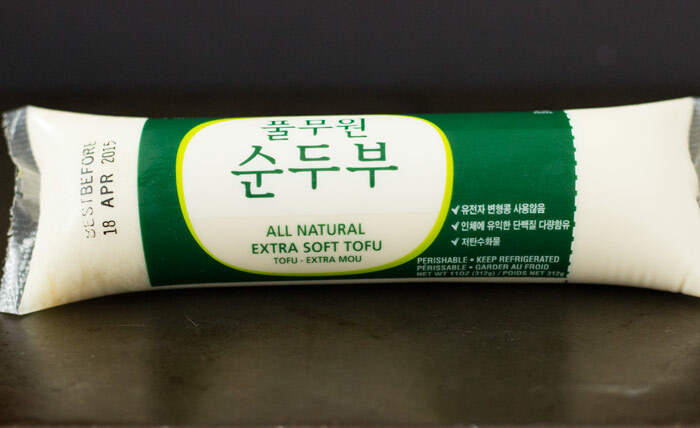 Unlike other types of tofu which are sold in tubs, soondubu comes in plastic tubes in the refrigerated section of Korean markets. You can use other types of silken or soft tofu if you can’t find this, but go for the real thing if you can! Oh, and let’s not forget about the traditional serving vessel! While this is completely optional, soondubu jjigae is traditionally served still bubbling from stove to table in these stoneware bowls. I picked a few up from the Korean market (which also happened to have a homeware section) for about $8 a piece including the lid and the serving tray. Since they can be used directly on the stove (both gas and electric), it’s literally a one-pot meal! You can either serve this in one bigger bowl, family style, with individual bowls of rice, or in individual bubbling bowls. When I made this for dinner, I had two individual bowls on the stove at the same time, one for each of us! Don’t have these stoneware bowls? Just make the stew in a regular pot, ladle it into bowls, and crack and egg into each bowl. The heat from the broth will cook the egg in a few minutes. Once you have the broth made (which takes about 30 minutes), the dish comes together in about 15 minutes or less, which is my kind of dinner. Sauté bits of pork or pork belly (or even bacon / pancetta) in some oil, add the reserved mushrooms from making the broth, then your spices and broth and let it bubble to let the flavors meld. Take some help from the freezer aisle with frozen mixed seafood (usually a combo of squid, shrimp, mussels, etc. ), which cook in another 2-3 minutes, then squeeze in the tofu and break it up. A sprinkle of green onions for freshness and a last-minute drizzle of sesame oil bring the entire soup together. And last, but certainly not least, perhaps my favorite part of the entire stew…an egg! One for each person, cracked directly into the middle of the bubbling cauldron. Break it up and swirl it around, or spoon some broth on top to submerge and let it poach in the liquid. Korean stews are usually served with individual bowls of rice for each person and long flat spoons (like a tablespoon) instead of the bowl-shaped soup spoons you usually find at Chinese restaurants. Spoon some of the broth, tofu, and seafood over the rice and eat bit by bit, or take a half-spoon of rice, dip it into the broth, and eat. Note: I only learned the traditional way to eat this by paying a little too close attention to other people at restaurants! Alongside any proper Korean meal is an assortment of banchan, or side dishes. You’ll find everything from kimchi and other pickled vegetables, to fermented black beans, pickled garlic, and fish cakes. I sometimes make my own but often just buy a few interesting things from the prepared food section of my Korean grocery store. If you like spicy food, this is comfort food at its best. The broth is rich and spicy, without being overwhelming, and it’s filled with tender seafood, bits of pork, and tons of creamy tofu. What could be better than that? Scroll down for the full recipe and make sure to read our Cooks Notes for extra tips and tricks! Please make sure to look at the Cooks Notes at the bottom of the recipe! First, make the stock: Rinse the dried kelp and dried mushrooms under cold water to remove any dust. Add to a medium-sized stockpot. Remove the head and intestines from the dried anchovies, rinse under cold water and add to the pot. Add the onion and water. Cover, bring to a boil on high heat and boil vigorously for 5 minutes. Reduce the heat to a simmer and cook for another 20 minutes. Remove the mushrooms and set aside to cool. Strain the stock and set aside until ready to use. Once the mushrooms are cool, slice into strips. Heat a Korean stoneware pot over medium-high heat. Add the pork belly and saute until lightly browned. Add the garlic and reserved sliced mushrooms and cook for 1-2 minutes. Add the red pepper paste, red pepper powder, and sugar. Stir to combine then quickly add 2 cups of the reserved stock. Add the soy sauce. The pot should be fairly full. Bring back to a boil and cook for 5-6 minutes over medium-high heat. Add the seafood, stir, and cook for 2-3 minutes. Cut the tube of tofu in half and squeeze into the stew. Break it up slightly (but not too much) to submerge. Sprinkle the green onion over the top and drizzle with sesame oil. For each person, crack an egg into the stew and serve immediately while hot and bubbling, with a bowl of rice on the side. This recipe is scaled for 1 serving. You can easily double / triple/ quadruple the recipe as needed. This can be served in a variety of ways, depending on what kind of bowls you are using. Traditional Korean stoneware bowls come in a variety of sizes, from individual to family-size, and can be placed directly on the heat. If you are using the individual size bowl and scaling up the recipe for more than one person, just make 1 big pot of stock to start. Then, put as many stoneware bowls onto separate burners on the stove as you need. Get them going at the same time then divide up the ingredients as you add! Alternatively, use a larger bowl for family-style eating. Just make sure to crack an egg in there for each person. Slabs of pork belly can be found in most Asian grocery stores. If you can’t find pork belly, thick cut pancetta makes a good substitute since it isn’t smoked like bacon. Alternatively, feel free to use any fatty cut of pork, like pork shoulder…or, if you dare, leave it out. Gochujang (Korean red pepper paste) and Gochugaru (Korean red pepper powder) come in varying degrees of heat. In this recipe, I used the “medium” level of each. If you like it spicier (like, really hot), feel free to add an extra tablespoon of hot pepper powder. Vijay, this is remarkable!! I need to watch Maangachi more often now! The details of the recipe, how to eat and the ingredients are just wonderful! We shop at a Vietnamese market that has some of the same ingredients and I am sure there is a Korean market nearby too since we have such a large Asian community! I need to make this and already have the Korean red pepper! Thanks for posting this so quickly..just gorgeous! @samanthaferraro:disqus Thanks Sam! Glad you liked the recipe and all of the tips! I know that these kinds of cuisines can be intimidating if you don’t have an “interpreter” along the way. One of the best parts about these ingredients is that they last a long time so you can just keep them in the fridge for whenever a Korean food hankering arises! Sounds really tasty! However in my country all that sea food is really expensive! Maybe someone can suggest me some surrogates? I will also ask this question to writers from http://writemyessayx.com/, they all are so smart and always know all answers. Whatever meat you want, really, or even just use mushrooms. The Korean restaurants where I live offer a ton of options: seafood, beef, chicken, pork, kimchi, or mushroom, or a combination of those. I like to make mine with ground beef, mushrooms, and a little bit of shrimp.